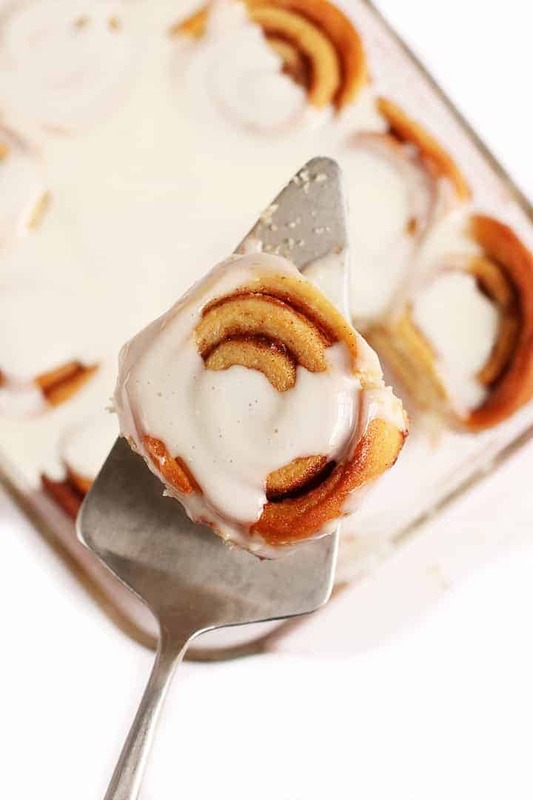 These easy vegan cinnamon rolls are sweet, tender, and filled with cinnamon flavor for a plant-based spin on a classic favorite. Simple and fool-proof. I don’t think there is a better smell than that of freshly baked cinnamon rolls. Despite cinnamon rolls being among the most wonderful foods, they can be a little bit daunting to make. With the rising and the rolling and the more rising, I mean, come on! But really, cinnamon roll making does not have to intimidate. They are really quite simple to make and the perfect activity for a rainy day at home. 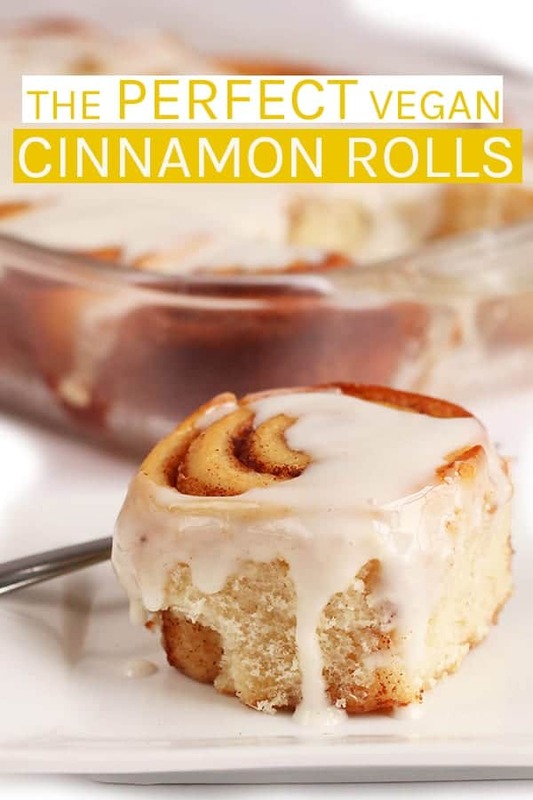 Today I’m going to walk you through the steps of making these easy vegan cinnamon rolls so that, if you’re so inclined, your house can be smelling as heavenly as mine in just a couple hours. Making the dough is pretty straight-forward. To start, we’re gonna want to activate the yeast in warm milk. While that’s activating, we can mix together the dry ingredients with a little bit of vegan butter. With the motor running, we add in our chickpea flour concoction (serves as an egg replacer) and activated yeast. Once the dough is, well, dough-like we’re gonna flip it onto a floured surface, kneed it for about 5 minutes, and place it in an oiled bowl. Next we cover it for our first rise. We’re looking for our dough to double in size; this should take about an hour. Once your dough has doubled in size, transfer it back to a floured surface. At this point we’re gonna roll the dough into a rectangle about 1/4″ thick, trimming the edges so that we have nice, straight lines. Once our rectangle is made, we spread a whole lotta vegan butter over the entire surface and top it with cinnamon and sugar. Then we start rolling it into a long, thin, cinnamon-y log. Cut the roll in 1″ pieces and place them in an oiled dish. Cover and let double in size again. Notice the difference before and after the 2nd rise in the two pictures below. Now the waiting is over and the baking can begin! 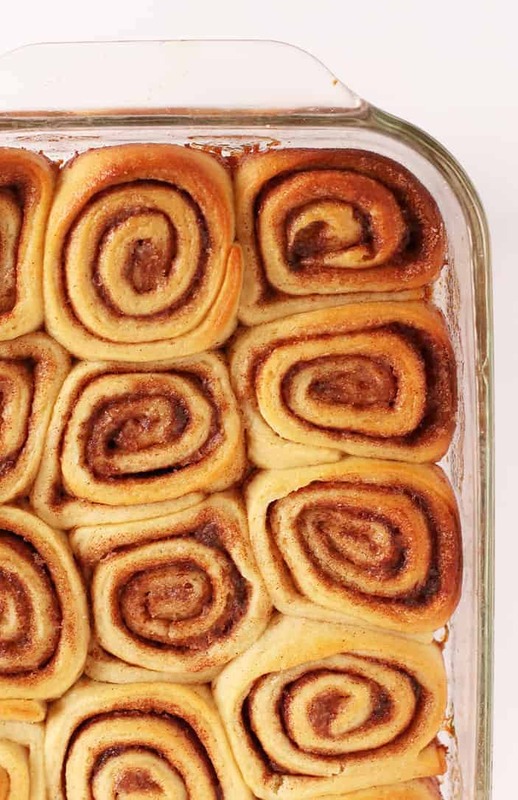 We are going to bake these cinnamon rolls for about 25 minutes at 350 degrees F. We’ll know they are done because they will be golden brown on top (see picture below) and your house will be deliciously fragrant. Heat 1 cup of soy milk over medium heat until milk is warm but not too hot to touch (about 100 degrees F). Stir in dry active yeast and set aside for 10 minutes for yeast to activate. Combine the remaining 1/4 cup milk with chickpea flour, whisking it together until thick and gooey. Set aside. In the large bowl of a stand-up mixer, combine 2 cups flour, sugar, salt, and vegan butter. Using the hook attachment, mix to combine. With motor running, slowly add chickpea flour and yeast/milk mixtures, scrapping down the sides as necessary. Add the remaining flour 1/2 cup at at time and beat to combine. Once the dough starts pulling away from the sides of the bowl and is soft to the touch, the dough is done. Transfer to a floured surface and kneed the dough for about five minutes. 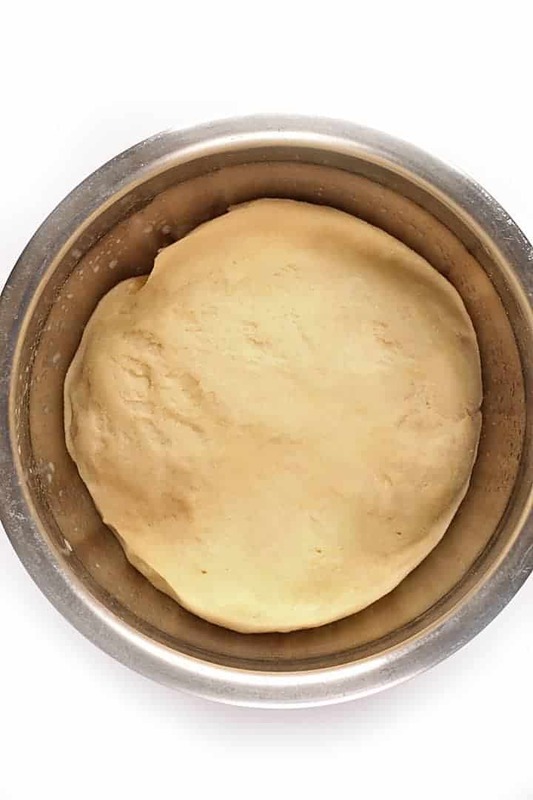 Shape into a ball and place in a large oiled bowl, cover in plastic wrap, and place in a warm area of your house for 1 hour or until dough has doubled in size. When dough is ready (you will know if when you stick your finger in it, the dent remains), roll out onto a floured covered surface into a large rectangle about 1/4 ” thick. Trim edges. Spread the vegan butter over the entire surface of the dough, leaving the top 1/4" of the rectangle clean. Combine cinnamon and sugar and spread evenly over the butter. Starting at the bottom of the rectangle, roll dough evenly into a tight roll. With your fingers press together the seam. Seam side down, cut dough using a serrated knife into 15 equal pieces, about 1” thick. 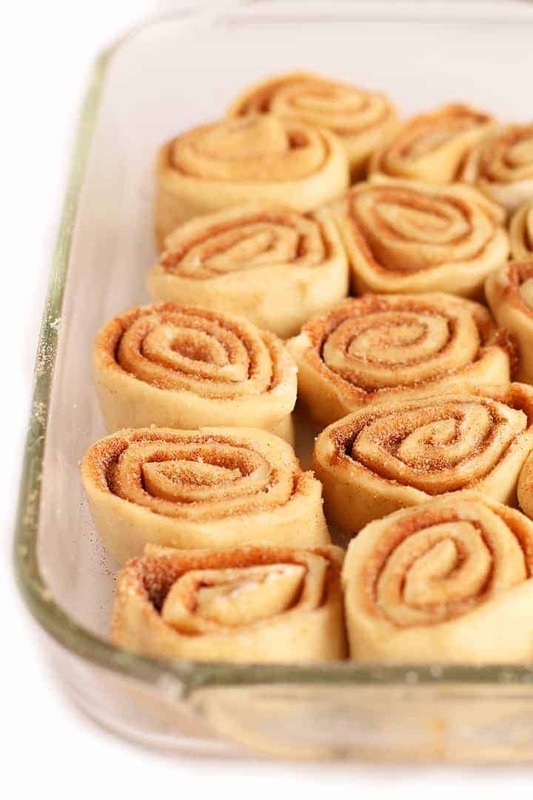 Place cinnamon rolls evenly in oiled 9x12 (or similarly sized) pan. Cover and allow dough to rise for a second time until doubled in size, about 40 minutes. Preheat the oven to 350 degrees F. Once cinnamon rolls are ready, remove plastic wrap and brush tops and sides with soy milk (optional). Bake for 25–30 minutes, until golden brown and fragrant. Remove from oven, transfer to a cooling wrack and allow to cool for 10 minutes. 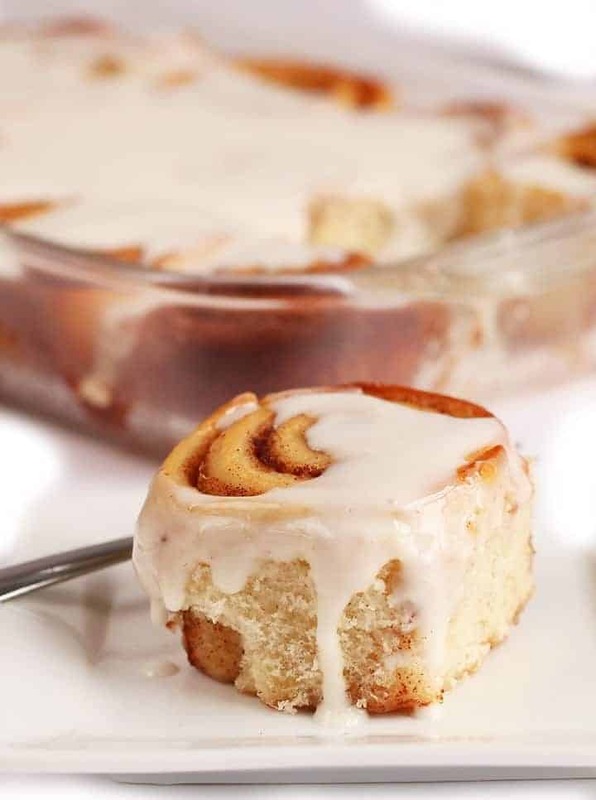 Combine ingredients for the glaze and pour on top cinnamon rolls. Serve warm. Your yeast could have expired or the liquid might have been too hot when you added the yeast. Both these things will deactivate the yeast and affect the rise. I hope that helps! These looks absolutely incredible! I’ve written them down on my to-bake-list and will be making them asap! Thanks for the recipe! I’ve made these twice now, it’s a great recipe! The first time I made rolls from the entire recipe, the second time I divided the dough in two and made a cinnamon twist from one half and rolls from the other half. I did substitute olive oil for the vegan butter because that’s all I had, it still worked out great. The chickpea flour is a great egg replacer that I’ll be keeping in mind for other recipes as well. I like how easy this recipe is too! Likely I will experiment but wanted to check to see if you’ve substituted these things and had any insight to save me time. If I were you I’d look for a healthy vegan cinnamon roll recipe. These are not intended to be healthy and I don’t think you’ll like the results with those subsititions as they were made for the specific ingredients as listed. I have an egg replacer. How much of it would I use if I didn’t want to use the chickpea flour concoction? It depends on what kind of egg replacer it is. I recommend the chickpea flour egg for the best results but if you’re going to try something else, you’re looking to replace about 1 egg. I don’t think so. The chickpea flour mixed with water makes a great egg substitute because of the proteins from the chickpea flour. You wouldn’t have the same results with coconut flour, unfortunately. Would any non-dairy milk (almond milk, in particular) be fine to substitute for the soy milk? Yes, some non-dairy milks are thinner than soy so I would recommend using one that is similar in thickness, like cashew milk or almond milk, but really any would work. The best thing would to be bake them uncooked, before 2nd rise. You will then want to let them thaw and rise before baking. Would almond butter work in the place of vegan butter? I wouldn’t recommend it. It would affect the taste and texture significantly. If you are wanting to change out the vegan butter for solid coconut oil in the dough, that would work out all right. Although, I personally would still use vegan butter for the filling. I don’t have electric mixer with hook attachments – what non electric utensil could I use? Would it be ok to make the mixture the night before to make in morning? Thank you 🙂 So, 1 flax egg will do for this or do i need more?